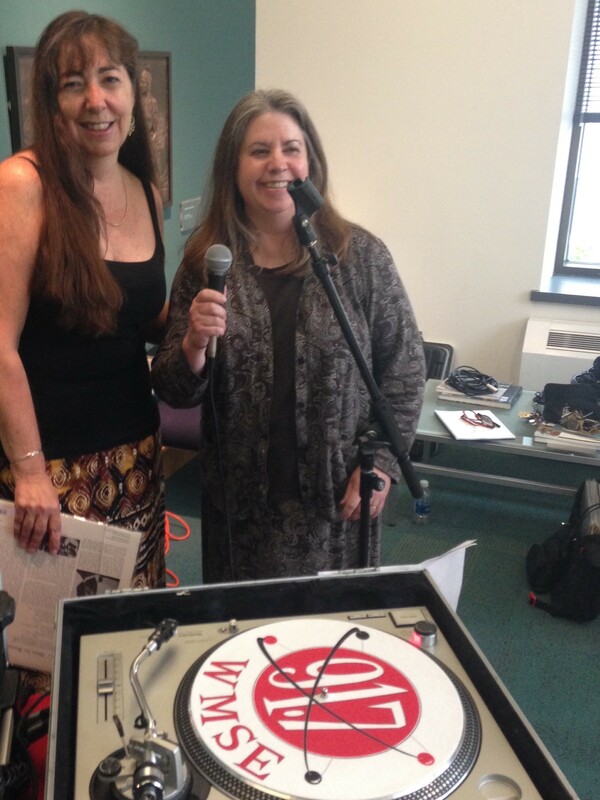 What a nice surprise this afternoon to discover that my old friend Sonia was broadcasting her WMSE (91.7FM) “Blues Drive” radio show from the Grohmann Museum to promote Gallery Night. I was working late this afternoon when I saw her set up with all her equipment in the corner near the second floor elevator. When I stopped to say hello, she put me on the air and asked me about my students, the museum’s art, and my blog. As I tried to explain my blog’s name, I realized it could use a better title than “KatherineWikoff.com.” It seemed so simple when I set it up, especially since “Katherine Wikoff” was the first potential domain name I tried that wasn’t already taken when I went to register my blog. A “titled” blog name would be a lot easier to describe and a lot more memorable than my own “name” name. But, oh well. It is what it is. Sonia and I have known each other since working together many years ago. In October 2012, a few months after starting my blog, I visited her while she did her Friday afternoon “Blues Drive” show at WMSE and then wrote up an account of our conversation in a blog post. It is one of my most viewed posts ever. So if you’d like to read more about the voice behind Milwaukee’s best (actually America’s best, in my opinion 🙂 ) blues show, you can link to my “Sonia – Blues Radio DJ” post here. This entry was posted in Life, Milwaukee, Music, Writing, blogging and tagged "The Blues Drive", blues music, Gallery Night, Grohmann Museum, Milwaukee, Milwaukee School of Engineering, Sonia blues radio, WMSE 91.7FM. Bookmark the permalink. Love the pic. You look so cute! It’s so nice to run into old friends!